"GRUENSCH GRAND REFERENCE is the ultimate reference speaker and our homage to the beauty and fascination of music. Years of fundamental research and development form the basis for this technologically and sonically outstanding reference loudspeaker." A unique, holistic technical concept was combined with an impressive, acoustically-ideal and elegant design to create a total work of art. 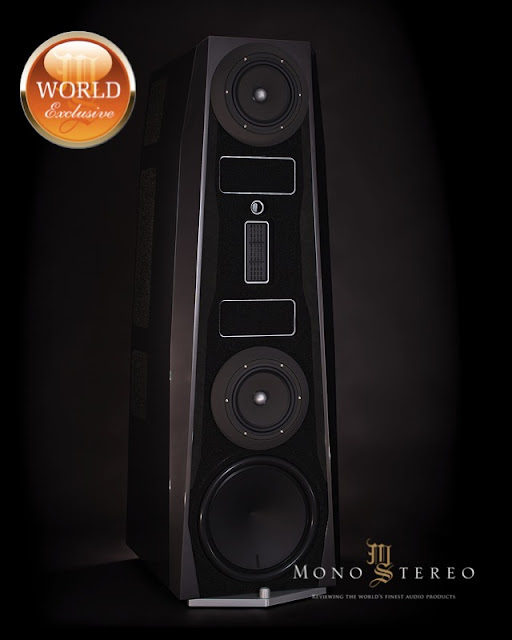 Passion, deep musical understanding and decades of listening experience have made GRAND REFERENCE what they are today: Musical masterpieces of loudspeaker art. GRUENSCH GRAND REFERENCE - Experience music as pure emotion - holistic and lifelike without limitation. GRUENSCH SINGLE DRIVER WIDE RANGE CONCEPT- Broadband concept - The most important frequency ranges from the medium midrange to 15 kHz (more than four octaves) is reproduced absolutely seamlessly by a single broadband planar magnetic transducer. Driver Complement: 1x Ribbon-Supertweeter, 1x broadband 20cm (8”) Planar Magnetic Transducer (midrange/treble), 2x 25cm (10”) Planar Magnetic Transducer (midrange), 2x 22cm (8.5”) Bass, 1x 38cm (15”) Sub-bass, selected in pairs"
Active 15“ Sub-bass - Active 38 cm (15”) sub-bass in the frequency range from 15Hz to 50Hz with separate electronic crossover and external power amplifier. 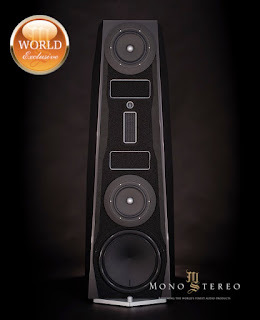 Extremely Tight Tolerances and Highest Precision - Strict pair selection of loudspeaker drivers and very accurate matching of left and right speakers." "TIME COINCIDENCE AND WAVEFORM INTEGRITY - Time accurate music reproduction that preserves the integrity of the recorded waveform and the timing relationships between ranges of frequencies (Ideal step response and squarewave response). PHASE COHERENCE - Flat acoustic phase response and minimum phase shifts. The aligned drivers are all connected in positive phase so that they push and pull in unison. PERFECT TRANSIENT RESPONSE - Ideal, very fast and time coincident transient response and therefore no smearing of the music signal over time. FAST SPECTRAL DECAY / MINIMUM ENERGY STORAGE - Minimum energy storage resulting in an exceptionally even and fast spectral decay. 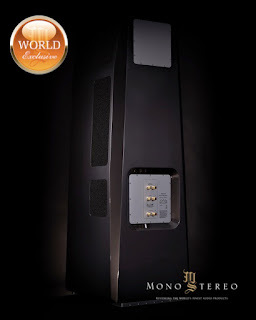 ULTRA WIDE FREQUENCY RANGE - Exceptionally wide frequency range of 15 Hz - 100.000 Hz (-3 dB) and thus complete reproduction of the entire music spectrum with all harmonics and deepest spatial cues (true full range). IDEAL DISPERSION CHARACTERISTICS - Ideal dispersion characteristics for better imaging and less coloration from the environment. Very wide and even horizontal dispersion and limited vertical dispersion, so that floor and ceiling reflections are minimised. TRULY REALISTIC AND NATURAL IMAGING - Precise positioning and impressively natural reproduction of scale and space. NATURAL SOUND FIELD - Optimized diffuse sound field for particularly natural large and free spatial representation and immensity of the soundstage in every direction." "SEAMLESS SONIC REPRODUCTION - Seamless, homogeneous reproduction, since the range from the middle mid-range up to 15.000 Hz is reproduced by a single planar magnetic transducer, so that there is no transition from one chassis to the other, especially in the highly sensitive acoustic range of 2 kHz to 5 kHz. Diffraction and Reflection Free Radiation - Diffraction and reflection free radiation and thus exceptionally natural purity of sound. SONIC HOLOGRAPHY - Complete detachment of the sound image and holographic three-dimensionality through acoustically "invisible" and non-locatable cabinet, the speakers fully disappear sonically"
The unique technical concept and the resultant qualities serve only one purpose and then completely disappear behind the result: perfect musical enjoyment as a uniquely inspiring and fulfilling human experience. GRUENSCH GRAND REFERENCE offers you a previously unattained musical experience and stands out in its sonic qualities even from the best previous loudspeaker concepts. "Natural, homogeneous and musical sound as an integrated whole. Lifelike immediacy and sovereignty with excellent rhythm and timing"
Emotionally touching and captivating reproduction of music in perfect beauty and harmony, providing deep insights into the character and soul of music"
But words can only begin to describe what happens in reality when you experience music through these exceptional speakers for the first time. Expect an overwhelming and comprehensive musical experience that can only be surpassed by a live concert. Only the best and finest materials are used for GRAND REFERENCE. The luxurious overall composition of high-gloss lacquered and hand-polished loudspeaker cabinet, velvety matt Nextel-coated elements, Alcantara inlays as well as silver anodised and polished aluminium elements captivate through visual tension, sensuality and timeless beauty. Each pair of GRAND REFERENCE loudspeakers are manufactured in Germany with the greatest care and appreciation for the product. In countless working hours, exclusive and ground-breaking masterpieces of loudspeaker construction are created with the finest craftsmanship. (Required separate external poweramplifier not included in the scope of delivery)"
"All transducer are time-aligned and mounted in a massive plate (15mm) milled from solid aluminium, that is resonance-optimized and reflection-free due to sophisticated acoustical damping. All transducers are carefully selected in pairs." (Midrange/Treble)" Components of highest quality laboriously point-to-point wired and mounted on a resonance optimized composite plate (massive plate milled from solid aluminium / MPX wood). Crossover Bass Components of highest quality laboriously point-to-point wired and mounted on a resonance optimized composite plate (massive plate milled from solid aluminium / MPX wood). suitable for banana plug (4mm) or spades (6-8mm)"